In recent years, perovskite solar cells have shaken up the solar cell research community. Never before has a new kind of material reached efficiencies that are competitive with those of the industry standard, silicon, as quickly as the perovskites have. This has captured the interest of many researchers and led them to shift their research focus onto this kind of absorber. Many pages could be written about the underlying physics, different fabrication methods, open questions and practical problems surrounding these cells, but this is not what this blog post is about. Instead, I want to focus on a seemingly simple question: What is perovskite? Back in 1840 when the word was first used this question was easy to answer. Perovskite was the name for a new mineral the German mineralogist Gustav Rose (1798-1873) had identified in the Ural Mountains in Russia1, composed of calcium, titanium and oxygen. Rose named it after the Russian mineralogist Lev Perovski (1792-1856). Things grew more complicated in the 1920s when the geochemist Victor Goldschmidt (1888-1947) began to study the crystal structure of various materials. He grouped them depending on their structural properties, and one of these groups got its name from the perovskite mineral. Suddenly, perovskite was not just the name of one mineral but denoted a whole group of compounds. 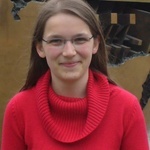 Only 20 years later, the Irish crystallographer Helen Megaw (1907-2002) published X-ray diffraction data revealing the detailed structure of the perovskite mineral. In time scientists made great progress at measuring the crystal structures of materials, and as more and more compounds became known the perovskite group grew larger and larger. Soon, artificially produced compounds were also added to the group. Today a large number of compounds are classed as perovskites, and posses a fascinating variety of properties that are used in many different applications; calcium silicate (CaSiO3) is abundant in the lower part of the earth’s mantle and is used in ceramics and in brakes and clutches; barium titanate (BaTiO3) is a dielectric material commonly used in capacitors; or yttrium barium copper oxide (YBa2Cu3O7) which is superconductive at relatively high temperatures. A recent addition to the perovskite group is methyl-ammonium lead iodide (MAPbI3). This is the perovskite photovoltaic scientists mean when talking about ‘perovskite solar cells’. Thin films of MAPbI3 absorb light exceptionally well, and can be used to fabricate solar cells which are very good at converting sunlight into electricity. But what unites all these materials? What makes them perovskites? All different perovskites have the same (or very similar) crystal structure as the original mineral Rose discovered in 1840. 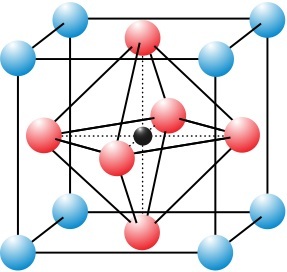 The ideal perovskite structure is a cubic crystal containing three different elements arranged as shown in the picture below. The pictured structure forms at a tiny, atomic scale and is repeated many million times to form a piece of material which is big enough to see with our eyes. Of course, we cannot see the atomic crystal structure that perovskites and many other elements posses. To measure these structures, methods like X-ray diffraction are used which allow scientists to learn about these tiny structures. The different positions in this arrangement are often labeled as A, B and X. Typically A and B are two different metals and X is oxygen, but many other materials can form into a perovskite structure as well. These three positions can be filled with a large variety of elements but not every combination is possible. Several factors have to come together for a perovskite structure to form. One important requirement is that the radii of the three components need to fit together. Goldstein studied extensively which combination of radii can be arranged in a perovskite structure. He summarized his findings in what is today called Goldstein’s tolerance factor t. From many experiments on many different perovskite materials, scientists know that this factor needs to be between 1 and 0.8 to form a perovskite structure. If one of the three components is either too big or too small they do not combine at all, or the material forms in another crystal structure. But if the three components fit together a perovskite crystal can form. Because MAPbI3, the new material researched for use in solar cells, has a rather complicated name, people often just refer to this compound as perovskite. So within the solar cell research community this is what the word perovskite usually means. However recently scientists have started exploiting the variability that this material shares with other perovskites and have begun to alter its composition. They have created materials such as MASnI3 (methyl-ammonium tin iodide), FAPbI3 (formamidinium lead iodide), MAPbBr3 (methyl-ammonium lead bromide) and many more. Anyone who feels intimidated or confused by these long names is definitely not alone. They are very long names and can end up being real tongue-twisters. Instead of saying the full names researchers have resorted to using acronyms (e.g. MAPI, pronounced map-pee) or just referring to all these materials as ‘the perovskites’. So even within the subfield of solar cell research the word perovskite can again refer to both a specific material and a whole zoo of materials. Rose, Gustav. 1840. “Ueber Einige Neue Mineralien Des Urals.” Journal Für Praktische Chemie 19 (1). WILEY-VCH Verlag GmbH: 459–68. doi:10.1002/prac.18400190179. ‹ Image of the week: can you hear electrons whisper?